The Danish String Quartet’s love of traditional Scandinavian folk music is becoming as well known as the quartet’s masterly approach to the classical repertoire. 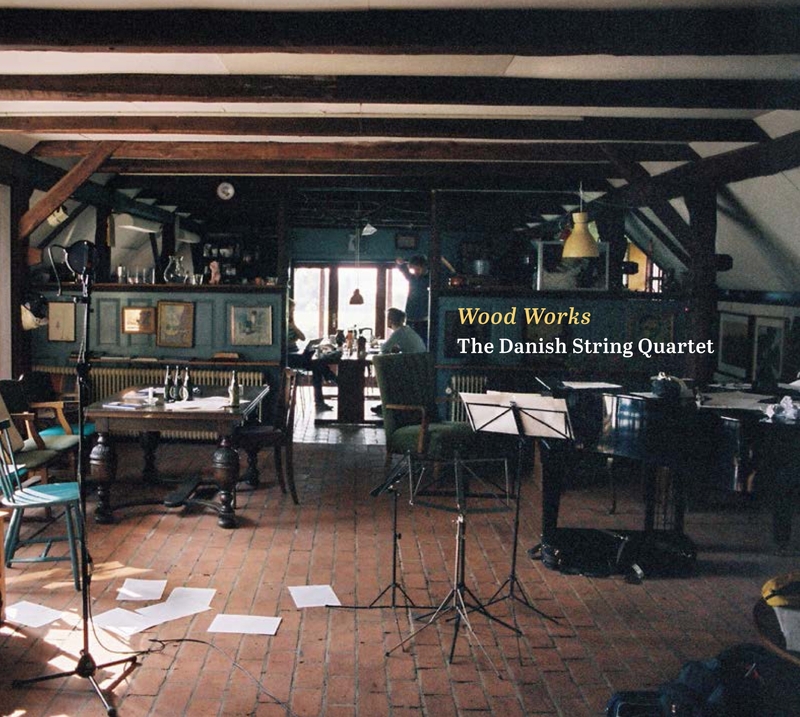 Now the renowned ensemble, at present house quartet at both the New York's Lincoln Center Chamber Music Society and BBC Radio 3, is releasing the album “Wood Works” on both CD and LP. Here the four strings present their favourite melodies from Nordic folk music – including the 400 years old bridal music from the island of Fanø that has spread far and wide as a video with over 50,000 plays on YouTube and Vimeo . "Det er specielt at høre en så dygtig og engageret klassisk strygekvartet tage sig af kendte og i hvert fald typiske dansemelodier i så begavede arrangementer." "På denne udgivelse er højdepunkterne de stille, lyriske numre"
"This is a straightforward presentation of some very listenable but scarcely compelling music – everything is very well played." "Et gysende smukt album, hvor klassisk perfektion møder groovy danserytmer og melodier, der går lige i hjertet." "A quietly innovative and unexpected delight, whose charms only grow as the music unfolds track by track." "The Danish String Quartet gives terrific performances of these lovely arrangements." "It’s a charming, relaxing and thoroughly satisfying CD." "The result is a disc that can be played through with pleasure." "There is plenty of ambiance in this stereo recording, yet the placement of instruments in space have a solid image." "Closely recorded, the sound is dry but warm, picking up every turn of phrase in sharp detail. Highly recommended." Ye Honest Bridal Couple / Sønderho Bridal Trilogy - Part I 5:10 9,60 kr. Sekstur from Vendsyssel / The Peat Dance 4:01 6,40 kr. Waltz after Lasse in Lyby 4:42 6,40 kr. Ribers #8 2:58 6,40 kr. Sønderho Bridal Trilogy - Part II 3:10 6,40 kr. Five Sheep, Four Goats 4:30 6,40 kr. O Fredrik, O Fredrik 4:14 6,40 kr. Ack Värmeland, du sköna 3:15 6,40 kr. Easter Sunday / Polsk after Rasmus Storm 4:23 6,40 kr. Old Reinlender from Sønndala 3:05 6,40 kr. Sønderho Bridal Trilogy - Part III 3:40 6,40 kr. We are in the tiny village of Sønderho on the island of Fanø. It is the westernmost Danish island, and the wind lashes the shore relentlessly. Today is the third Sunday of July – it’s ’Sønderho Day’, a local day of celebration, music and dance. From the village hall the sounds of fiddles can be heard, and people are dancing round and round for hours. The music is simple, yet with a touch of exotic melancholy. In the forests of southern Sweden we find Lasse. He is a traveling fiddler and he provides the music for festive occasions. Lasse is poor, so he will play you some music if you give him a meal. As he can’t afford new strings for his violin, he tunes the ones he has down to make them last slightly longer. His claim to fame is a waltz he is always playing; a little melody that people enjoy dancing to. Sometimes Lasse plays it to himself while sitting alone in his wooden shed. Up in Norway a young man has just returned from his Grand Tour of Europe. While passing through the Rhineland, he picked up a very popular dance that everyone danced in the elegant salons. He doesn’t know the name of the dance, so he simply calls it a ‘Reinlender’. Wanting to introduce it to his friends, he writes a couple of tunes to accompany the new dance. Folk music is the music of all the small places. It is the local music, but as such it is also the music of everywhere and everyone. Like rivers, the melodies and dances have flowed slowly from region to region: Whenever a fiddler stumbled on a melody, he would play it and make it his own before passing it on. You don’t own a folk tune, you simply borrow it for a while. the string quartet is capable of expressing a myriad of colours, nuances and emotions – just like folk music. Our idea is to marry these two simple but powerful things; the folk music and the string quartet. Normally the string quartet has been reserved for the classical masters. Now we want to see what happens when we let the Nordic folk music flow through the wooden instruments of the string quartet. Does it work? We hope so. And remember: We simply borrowed these tunes. They have already been returned. We set out in the fog covering the Faroe Islands. A lonely violin plays a traditional Faroese wedding song. After a while we reach the Danish island of Fanø to immerse ourselves in Part I of the Sønderho Bridal Trilogy, a set of three sønderhonings that dates back some four hundred years. A Danish sekstur is a lively dance that closely resembles the Irish jig. The Peat Dance is a Danish reeltune. Thus this is a Danish version of the traditional Irish jig-reel set. Vigstamo was a small farm in the Gudbrand Valley in Norway, and Vigstamoin was the man who lived there. This tune is a springleik – a local version of what we in Denmark call a polsk. Lasse lived in Lyby in Sweden’s Skåne region and he was a travelingfiddler playing for food. He was known for often playing this simple little waltz. Ribers #8 is a polka: A dance that originated in central Europe and, somewhat confusingly, has nothing to do with the polsk or polska. This is one of the happiest Danish tunes that we know. Notice the exotic colour of this sønderhoning. Some people believe that the people on Fanø learned their melodic twists from visiting sailors. Rune stumbled on this little Danish tune with its strange name and liked it so much that he came up with an arrangement for three string quartets. Our cellist Fredrik is a tough Norwegian sailor. His childhood friend Johannes Rusten wrote this catchy tune and dedicated it to him. An old Swedish folk song. The title was given in the 19th century and celebrates the beauty of the Värmland region. We pair a polsk from 1989 by Danish fiddler Poul Bjerager with an old polsk we found in a handwritten collection of tunes from the 1760s by Danish sailor and fiddler Rasmus Storm. Here is a nice little polska (Swedish for polsk) from the region of Dalarna in Sweden. The title indicates that this dance came to Norway from the Rhineland. In Denmark we call this type of tune a schottis. Did it come up north via Scotland or Germany? Not so important, perhaps. The funky possibilities of the tune inspired us to make this arrangement. This is dance music, but inspired by the unique tonal colours of the music our good friend Nikolaj Busk made a very contemplative arrangement of this final part of the Sønderho Bridal Trilogy. After all the excitement of reels, polskas, sheep and goats, we are back at the island of Fanø, disappearing into the Atlantic fog. All arrangements by The Danish String Quartet except for track 13 arranged by Nikolaj Busk. Thank you Kirsten Kjær Museet, Harald Fuglsang, John Anderson, Ruth Højlund, Ulla Bondam, Zoran Luka, Poul Bjerager, Mads la Cour, Johannes Rusten, Nikolaj Busk, Jon Faukstad, Harald Haugaard, Peter Uhrbrand, Sebastian Eskildsen, Caroline Bittencourt, Denise Burt, Solistforeningen af 1921 and all the wonderful people who supported this recording on Indiegogo.